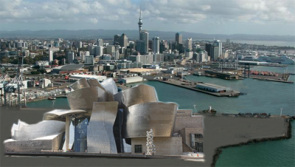 How about a leading global research university, based on a piece of breathtaking architecture like Bilbao's Guggenheim Museum, on Auckland's waterfront? A group of Auckland business interests has come up with the latest proposal for an Auckland Waterfront Stadium. Ever since the concept was seriously looked at by the Government in 2006, with the 2011 Rugby World Cup in mind, it has refused to die. Various others have talked up the idea over the past decade. For example, two years ago Eric Watson - he of Hanover Finance  fame - was offering to invest in an Auckland Waterfront Stadium . The latest proposal , from the Auckland Waterfront Consortium, would involve them clipping the ticket as the middleman between developers and financiers on the one side, and the Auckland Council on the other. They claim the stadium would come at no cost to ratepayers or taxpayers, but they want long term leases over public land at the waterfront and Eden Park. The proposal is at a very early stage, despite the Consortium apparently having worked on it for 18 months. No feasibility study has been done, and nor has a proposal targeting developers and investors been put together. And would a stadium even be the best use of that prime waterfront site around Bledisloe Wharf? Currently it's effectively a carpark, used by Ports of Auckland for car imports. This operation would have to be relocated, which would presumably cost someone - likely Auckland ratepayers - something. An alternative idea for Auckland's waterfront that caught my eye a few years ago came from Michael Parker. Parker is an ex-pat Kiwi who lives in Hong Kong where he works as an equity strategist for Bernstein. Parker floated the idea of building a world class university on Auckland's waterfront to drive an innovation economy. He did this through a book 'The Pine Tree Paradox, why creating the New Zealand we all dream of requires a great university,' which was published in 2010. Parker argued that New Zealand needs to develop a cluster of world-class innovative companies. "The decline in our living standards and wealth relative to the rest of the OECD has been a function of our reliance on agriculture at a time when rich economies get richer by developing ideas, not by growing trees or making wine. Accordingly, we do not need to abandon agriculture, but agriculture will not return us to the top of the OECD league tables in terms of GDP per capita," he said. "For that, something else is required; specifically, innovation and an ecosystem to support and foster it. At the heart of this ecosystem of innovation sits a world-class research university." Parker envisages the university being centred around a piece of breath-taking architecture on the Auckland waterfront along the lines of Bilbao's Guggenheim Museum or the Sydney Opera House. His idea involves creating a new, private research focused university good enough to be ranked in the world's top 20, or preferably top 10, with the Auckland Council donating Ports of Auckland land with the port shifting, the government tipping in about $220 million of taxpayers' money as a statement of intent to get the building up, and an endowment fund raising about $2 million a week for 30 years to get the university to the level where it can drive an "innovation cycle" with California's Silicon Valley the model. (Remember the book was written in 2010 so the sums may be different today). In 2011 I attended a weekend meeting in central Auckland where Parker, his book and idea attracted an influential group of business leaders, academics and others. However it appears no one has really run with the concept, whereas the waterfront stadium idea bubbles back to the surface every few months. Doubtless, a waterfront stadium has appeal. A centrally located, roofed stadium that's easy to get to and from and offers shelter from the weather, would be nice. But how many days per year does a stadium sit empty? And what sort of long-term jobs, beyond its construction, would one create? Probably predominantly low value hospitality jobs, and work for real estate agents peddling the proposed surrounding property developments and apartments built at Eden Park. In contrast Parker's university could create high value jobs, attract thousands of local and overseas students, be in use close to 365 days a year, and potentially offer a much greater, sustained economic fillip if it helps give birth to successful, innovative ideas and companies. Of course both building a stadium and building a university on the waterfront come with risk. Both require buy in from, and money from, local and central government and the support of Aucklanders. Plenty could go wrong with both ideas, and that's before we get to the concept of building on the waterfront in an era when rising sea levels are expected. But can we please broaden the debate out from just a stadium?